Daulton & Cassie’s wedding was on another level of fun! I feel as though I connected with them and their family in such a special way which allowed for some really cool personal touches and surprises. Working with their family and friends was such a fun experience. Daulton and Cassie had a fun way of doing things! First up for the wedding introduction into the room we used a pretty cool instrumental beat that went into another song but how they came into the room wasn’t like your normal couple would come in. Cassie & Daulton came in wearing their hockey gear and had the hockey sticks in hand. They went to the dance floor and joined the wedding party who cheered them on as they were about to go into a head on head game of hockey but just in a split turn of the moment Daulton took Cassie and dipped her down and kissed her… it was unlike anything I ever seen and was totally romantic and fun. I was able to also find out with some planning we had a few guests that could not make the wedding but at the very last minute I was able to get in touch with these guests and took a phone call and recorded that phone call during the cocktail hour (talk about cutting it close) I was able to edit that phone call and play it back right after the toasts…. talk about something heartfelt and powerful. 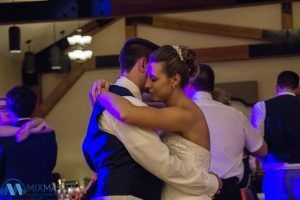 We had a lot of dancing throughout the night… from the first dance to Daulton surprising his mom by inviting him up to dance … but then mom surprised him with a special recorded message in their song. We also had a special song for Cassie from her mom as well that would play later in the night. Friends and family all had a blast dancing and celebrating the night away. Check out the video and photos below as well as special recordings.